If you visit Paris with kids, they may insist that you have to see the Eiffel Tower first. 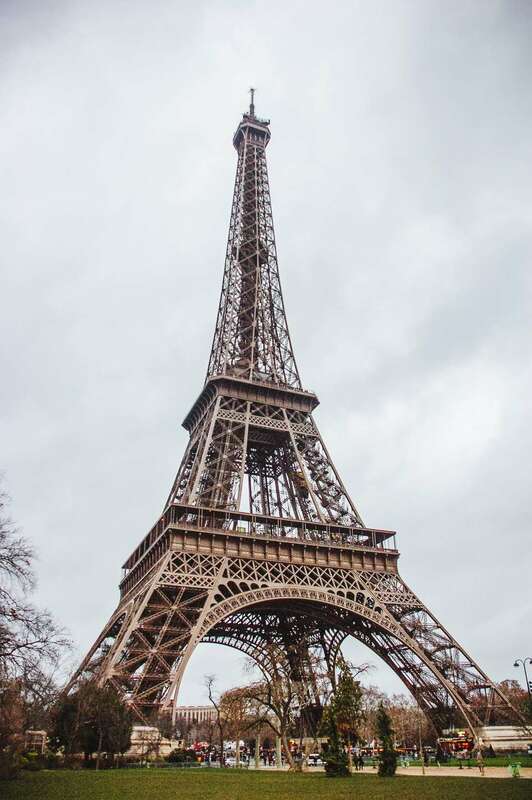 The Eiffel Tower—in French, La Tour Eiffel, pronounced toor ee-fell—is a much more wonderful piece of architecture than any pictures convey: massive, but airy. Try to visit the Eiffel Tower during daytime and also do a night visit too: the Tower is open late, often until midnight, and is a delightful experience, lit up in the dark with thousands of lights. The Eiffel Tower also has a fascinating history, including a stint as a radio transmitter during World War I. You'll find information displays on different platforms at the Eiffel Tower: allow plenty of time during your visit to learn about this landmark which, incidentally, was much criticized during its early years. The base of the Eiffel Tower encompasses a wide area, with ticket booths at several corners. Check around and see which one has the shortest line-ups. Lots of people will be milling around beneath the Tower, and some will be trying hard to sell you souvenirs. If you're not interested, don't give the slightest encouragement: even a smiling "I don't think so" is an invitation for more dialogue. On the other hand, you might wish to buy. Generally, prices will be highly inflated but will drop quickly with bargaining, We adults may turn up our noses at tourist trinkets, but many kids really treasure their little souvenirs. Once you've reached the upper platforms of the Tower, you can walk around and admire the view, with the city of Paris at your feet. You'll find both an outer (possibly windy) walkway and an inner area as well. Strategically placed photos point out the landmarks you're seeing, far below. Be sure to take the elevator all the way to the top level at least once. The Place du Trocadero is a great place to view the Eiffel Tower, and is especially fun on summer nights: you might see African dancers, in addition to sure sightings of Parisien lovers and the lit-up Tower. The Eiffel Tower is a playful place to visit. In many spots, you'll find signs with curious or amusing facts about the Tower's history. Visitors will learn, for instance, that the Eiffel Tower was used as a radio tower during WW1. Makes sense!